LOCK HAVEN – Lock Haven senior first baseman Brittany Pataky of Clearfield was named to the Pennsylvania State Athletic Conference All-Central Division second team last week for her outstanding hitting and fielding during the regular season. She led the Lady Eagles with a .371 batting average, compiling 39 hits in 105 at-bats, and had only two errors in 355 chances after going 22 games in a row without a misplay. Pataky belted one home run, two triples and six doubles and drove in 25 runs, tied for second on the team. She drew 13 walks, was hit by a pitch twice and put down a team-high 10 sacrifice bunts. Teammate Nicole Smith of Milton was tabbed Central Division Freshman of the Year and landed a first-team berth as the Utility/Designated Player, while catcher Alicia Cacciotti of Horseheads, N.Y., and shortstop Erin Clary of New Freedom (Susquehannock High School) joined Pataky on the second team. On Monday, Lock Haven (25-12) was selected for the Atlantic 2 Regional Tournament that begins Friday at Bloomsburg. The Lady Eagles will play West Virginia Wesleyan (46-6) after Shippensburg (28-13) takes on Bloomsburg (30-7) at 11 a.m. The tourney continues Saturday and Sunday. READING – Sophomore pitcher Holly Lansberry of Curwensville suffered two tough losses as Lycoming was held to two hits and one run in its first Commonwealth Conference Tournament venture last weekend. The Lady Warriors, who claimed fourth place after being pegged by the coaches to wind up seventh, were edged 1-0 by regular season champion Lebanon Valley Friday and 4-1 victims of a no-hitter by No. 3 seed Arcadia’s Kelsey Roberts Saturday at Angelica Park. Lansberry shut out Lebanon Valley for six innings before a walk, a sacrifice bunt and a two-out single gave conference Pitcher of the Year Laura Snyder the win on a two-hitter with nine strikeouts. Lansberry pitched a five-hitter, fanning four and walking three, one intentionally, and hitting one batter. Arcadia, which lost to No. 2 seed Messiah in the finals, backed Roberts with an 11-hit attack against Lansberry, who had one strikeout and no walks. She hit one batter. Lansberry was hitless in five at-bats, dipping her final average to .286, fourth highest for the Lady Warriors. She was 24-for-84 with one double, one triple and nine runs driven in. As the Lady Warrior leadoff batter most of the season, Lansberry drew 11 walks and had an on-base average of .368, second best on the team. Her fielding average was .978 with only one error in 46 chances. As the No. 1 starter, Lansberry pitched 116 innings in 21 games, starting 17 and completing 14. 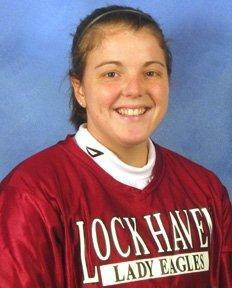 She posted a 10-8 record with a 3.26 earned run average, allowing 125 hits and 59 runs, 54 earned. Lansberry had 92 strikeouts and 44 walks. She hit five batters. Lycoming was a program-record 8-8 in the conference and 14-16 overall. ERIE – Freshman closer Chad Zurat of Clearfield worked a clean seventh inning to save the first game of Penn State Behrend’s 8-6, 6-1 sweep against Pitt-Greensburg Saturday in the first round of the Allegheny Mountain Collegiate Conference Playoffs. He sandwiched two strikeouts around a pop-up he caught. The No. 3-seeded Lions overcame a 6-0 deficit after the No. 6-seeded Bobcats spoiled the return of starter Mike Moyer, who had been sidelined three weeks because of an ankle injury. The sophomore right-hander from Clearfield gave up six runs, all earned, on eight hits in two innings. He struck out two. Kyle Kline of Clearfield was a late-game replacement at first base and grounded out in his lone appearance at the plate. Penn State Behrend will join No. 1 seed and host Penn State Altoona, No. 2 seed LaRoche and No. 4 seed Medaille in a double-elimination tourney that will determine the AMCC champion and NCAA Division III qualifier. Games are scheduled Friday through Sunday. Zurat has pitched 13 innings in nine appearances, chalking up three saves. He’s given up nine hits and eight runs, five earned, for a 3.46 earned run average. He’s racked up 22 strikeouts and walked five. Moyer has made seven starts and one relief outing with a 3-1 record and a 3.54 ERA. In 43.2 innings, he has allowed 37 hits and 20 runs, 17 earned. He has whiffed 32 and walked 11. Kline has played in 15 games with a .154 batting average. JOHNSTOWN – Sophomore center fielder Ben McGary of Curwensville had four hits in a crucial doubleheader with Mount Aloysius at Point Stadium May 3, but Pitt-Bradford had to settle for a split and fell short of making the Allegheny Mountain Collegiate Conference Playoffs, finishing 19-14. McGary singled and drove in a run as the Panthers kept their hopes alive with a 5-0 win in the opener. He singled three times in the nightcap, but the Panthers lost 10-5 for a 9-9 AMCC record, one game out of sixth place. McGary padded his final batting average to .306 for 29 games. He hit safely in 13 of Pitt-Bradford’s last 15 games to wind up 26-for-85 with three doubles and one triple. He drive in 16 runs and scored 17. Early in the season, the left-hander also was called on to pitch five times, including one start. In nine innings, He gave up five hits and two runs, both earned for a 2.00 ERA, while striking out eight and walking two. Freshman pitcher-outfielder Sam Gardner of Curwensville got into five games, walking twice in four plate appearances and logging four innings on the mound in two outings. He struck out four, walked none and surrendered seven hits and eight runs, six earned.